FILE - U.S. Vice President Mike Pence speaks to the media at the White House in Washington, Jan. 9, 2019. U.S. Vice President Mike Pence released a video message Tuesday to the people of Venezuela, urging them to "make your voices heard" in nationwide protests expected on Wednesday. Pence's message supported the political opposition to Venezuelan President Nicolas Maduro and his hard-left government. The opposition-controlled National Assembly, which Maduro has declared invalid, has called for Wednesday's protests. "We are with you," he told the political opposition in English, sprinkled with Spanish phrases. "We stand with you." The message was subtitled in Spanish. "We will stay with you until democracy is restored and you reclaim your birthright of" -- he switched to the Spanish word -- "Libertad," or, in English, liberty. In the message Pence calls opposition leader Juan Guaido, recently sworn in as head of the National Assembly, "courageous." He said the Assembly is the "last vestige" of democracy in Venezuela. His message concluded, "Vayan con Dios," or in English, "Go with God." On Monday the Venezuelan Defense Ministry said Venezuelan security forces arrested 27 National Guardsmen, after they allegedly revolted against the government of President Nicolas Maduro. 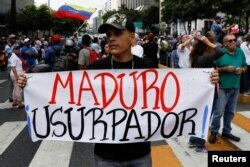 FILE - A man holding a placard that reads "Maduro usurper" takes part in a gathering with members of the Venezuelan National Assembly in Caracas, Venezuela, Jan. 11, 2019. The ministry said "a small group" of National Guard members had taken four hostages and stolen weapons from an outpost in Caracas' Cotiza neighborhood during a pre-dawn action. A few hours earlier, a group of guardsmen also reportedly posted videos on social media saying they won't recognize the Maduro government and urged him to leave office. They asked those seeing the video to help them overthrow the government. Maduro's administration has come under increasing domestic and international pressure as he begins a second term that that the opposition-led congress considers illegitimate.